This beautiful residence sits on a hilltop, with amazing ocean views. This spacious condo features 3 bedrooms, 2.5 baths, a living room with vaulted ceilings and sliding glass doors that open onto a private porch that overlooks the Pacific Ocean and Jaco. The Master Bedroom boasts a private balcony, master bathroom, and walk-in closet. Ideally located just a few minutes from the bustling beach town of Jacó, with many restaurants, shops and active nightlife. 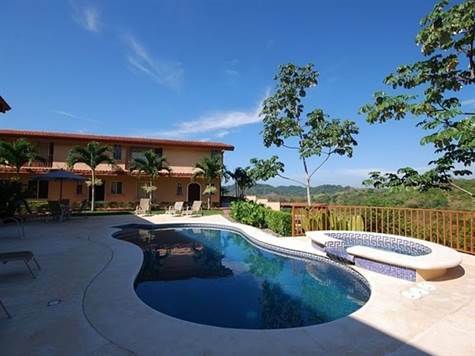 Also only 10 minutes to the Los Suenos Golf Course and Marina. This luxuriously appointed, condominium is located in a private community nestled between beautiful beaches and a lush rain forest. The community features a Private Pool, Jacuzzi, and Barbecue area in a beautiful garden setting overlooking Jaco and the ocean. Ideal as full time residence, or for the absentee owner that desires a property vacation with rental income.